Fu Biao, also named Fu Xingzhong, with a master’s degree,born in Kai County of Chongqing, is one of the ten outstanding figures of China's reform .Currently ,he holds the offices of the United Nations goodwill ambassador, vice chairman of the Chinese wushu association, chairman of the International Kung Fu Federation,chairman and President of global financial group (including: Global TV, Global Kungfu Website, Global Entrepreneurship Network, Global Kungfu Magazine, Beijing Shaolin Wushu school, the first campus, the second campus, Shanghai Pudong branch, Songjiang branch, Beijing Daxing Shaolin Wushu Institute), president of Chinese People's Anti-Japanese Military and Political College glorious traditional research association. 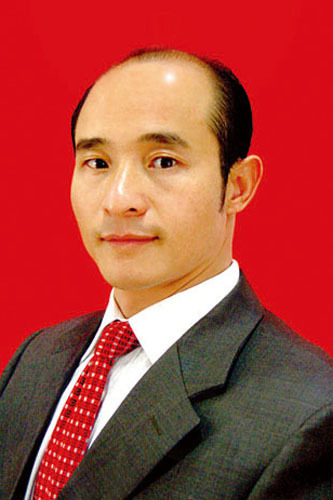 Fu Biao is energetic and enthusiastic about social affairs. He has occupied many social positions such as Beijing Youth Federation Committee member, president of Chinese People's Anti-Japanese Military and Political College glorious traditional research association,vice president of Beijing Primary and Secondary Schools Sports Association,vice president of Beijing Youth Education Association,vice president of Beijing Wushu Association,member of CPPCC in Changping District,president of Beijing Vocational Education Sport Association,vice president of Changping Youth Federation, Changping Calligrapher’s Association and Changping Poetry Association. Fu Biao has won the following prizes and titles of honor: the 5th One Hundred Excellent Personnel in China’s Reform, the 6th Top Ten Outstanding Personnel in China’s Reform, the 5th Chinese Times Ten Influential Personnel, “30 Years, 30 Persons” the star of reform—Leaders of Influencing China’s Reform, the 8th Ten Innovation Personnel in China’s Reform, Harmonious China 2009 Top Ten Influential Personnel, nomination for the 6th Beijing Ten Outstanding Youth, Beijing Excellent Educator, Top Ten Excellent Youth in Changping District, etc. Fu Biao wrote Teaching Materials of Beijing Shaolin Wushu School, compacted discs of Practical Routine Exercise of Beijing Shaolin Wushu School, the album Chinese Kungfu. He masterminded and organized scenic dramas Monkey King Havocs in Heaven and The 5,000-year History of China—Chinese Kungfu. Fu Biao has personally schemed and organized series of brand competitions, such as the sports meeting for Beijing Vocational Education system , the soprts meet for Beijing shaolin Wushu school , Wenwu Champions cup Sanda Tournament, Yunmengxia Water Ring championship, China VS Russia VS Ukrain Three Kingdoms sanda martial arts champions and Beijing International Wushu Culture Exchange Conference , Beijing World Kungfu Championship, etc. Fu Biao has held the post of the general Wushu guide as well as chief planner for the BTV "Super Power" column . Under the support of Chinese wushu association , Beijing municipal sports bureau and other related units, four consecutive terms of Wushu Culture Exchange Conferences has been successfully held, Fu biao served as executive chairman of the organizing committee for the first and the second session, Chairman of the organizing committee for the third and the forth session. Fu Biao was born in a literary family. Both of his grand father and father were local well-known writers. Under the influence of family, Fu Biao started schooling at 4. He was familiar with Chinese Poetry from Tang and Song Dynasty and browsed a large number of classics. Fu Biao started to practice wushu at 9. His first teacher is Wang Lishen, a famous boxer in Anhui. Then he became a disciple of Shi Yongxin, the abbot of Shaolin Temple. During his stay at the Shaolin Temple, Mr. Gu Youyi, the deceased famous martial artist, referee for international martial art matches and the former editor-in-chief of “Shaolin and Taiji” also gave him advises and directions on martial arts practicing. Then he went to China Wushu Institute for further study. Fu Biao is very gifted at martial arts and is reputed as “the prince of iron head” due to his unparalleled “iron head skill”. Well-learned and accomplished, Fu Biao graduated from China Calligraphy University, Peking University Institute of Marxism-Leninism, Capital University of Economics and Business. He enjoys writing poems. Perhaps influenced by his martial art background, his poems and calligraphy boast an air of majesty and virility, making him more than qualified for the title—the great talent in martial arts and calligraphy. Fu Biao won the prizes of calligraphy including middle age and youth group gold award of “The 4th Splendid China Cup Chinese Art and Calligraphy Works Competition” in which he was awarded the title of “Chinese Painting and Calligraphy Elite” and the painting and calligraphy group first prize of “Regression Cup” Painting and Calligraphy Competition. Calligraphy works “武”, “龙” and “神” were collected by Contemporary Calligraphy Remained Works. In late autumn of 1990, Fu Biao left Shaolin Temple for Beijing to set up a school with 170 yuan. He was active to develop wushu education and promote Chinese Wushu culture passionately. He started from scratch. Although he suffered a hard life he never gave up his ideals. With deep thoughts, superior gongfu and excellent literature, he had a history of legendary entrepreneurship. In Daxing Xihongmen his friend took him to look for school address with a disabled motorcycle. In a hut he wrote to all the students and friends he had taught to recruit. When it was cold as hell he lighted a stove and wrote with earnest haste and ecstasy. While spring came, the quantity of students was over 100. When Xihongmen club got along he settled at Changping Huata Heping Temple. Three years later he had 400 students which gave him great satisfaction. However, in Changping there had been twelve martial arts schools which imposed great pressure on him. With courage and wisdom he overpassed all the martial arts schools and established headquarters in Huilongguan which located in the east of Jingchang highway side road in Changping. From then on he had his own school. After the new Shaolin wushu school was established, there had been 8,000 students. During the opening ceremony the rain started to pour. Fu Biao wrote a poem with pride and then he was getting on well in his career. A few years later other martial arts schools in Changping closed down one after another whereas Beijing Shaolin Martial Arts School was bound to expand and prosper. In addition to establishing schools, Fu Biao also had unique concept in Enterprise Management. He set up five corporations which involved in many industries such as television culture, performance, website, magazine, advertisement, garment factory, commercial property and logistics. In 2005 he took the chairman of Beijing Vocational Education Athletic Association and made it become a national advanced social organization by his innovation and courage. In order to promote Chinese traditional Wushu culture, Beijing Shaolin Martial Arts School cooperated with China Webhouse to establish the world largest Kungfu media—Global Kungfu Website and Global Kungfu Magazine in early 2009. Fu Biao said that Chinese Wushu needed to be innovated. We should enhance the charm of wushu culture and upgrade the social values, social status and popularity of practitioners. Jan. 16, 2010, Global Kungfu Website Expert Committee was founded in Beijing International Convention Center. The first Wushu Summit Forum was also held there. The former and current leaders from Wushu Management Center of Chinese General Bureau of Sports, Chinese Wushu Association and Chinese Wushu Research Institute participated in the ceremony. Kungfu masters and wushu elites at home and abroad got together and discussed about the promotion of excellent national culture represented by Chinese traditional wushu culture. Fu Biao devoted himself to make Global Kungfu Website and Magazine become a platform to show Chinese national culture and lead the trend of Global Kungfu culture. In the October of 2010,Fu Biao had attended the 65th anniversary of the United Nations.On that occasion he had proceeded a profound talk with the United Nations secretary-general ban ki-moon.Fu Biao expected the United Nations could support the globalization of Wushu,so that Wushu could enter into the Olympic Games sooner or later,and then such a brilliant treasure of Chinese national culture would become the excellent culture of the whole people in the world. On the basis of the successful establishment of Global Kungfu Website, Fu Biao made further attempt in the development into the network media industry.After semi-annual's website construction and trial operations,Global Entrepreneurship Website and Global TV have officially been founded.Global Entrepreneurship Website is a strong transmission platform for entrepreneurs.Global television is a TV station which based on network platform and adhering to worldwide broadcast . Inheriting the media concept of "greater China, global vision" , Global Tv provides the global Internet users with martial arts, business information, culture and art related news, video broadcast. In order to provide the global Entrepreneurship with an information exchange platform,Global Entrepreneurship Net was established by Global Entrepreneurship Net Science Group ,which based on the Chinese market and to reach the global market goals. With global economic integration in nowadays,we should help entrepreneurs to set up the Great China awareness,have global view,global definition .We strive to make the most colorful and powerful website and to build the Global Entrepreneurship Net into a stage for the start-up people showing their charm. In the beginning of 2012,under the joint efforts of people from the martial arts circles,International Kungfu Federation was officially established. Fu Biao was elected as the first president.International Kungfu Federation aims to promote and encourage the development of martial arts, shaolin kung fu, sanda, tai chi, qigong and other sports at the international level in the form of various possibilities, carry forward the promotion of martial arts culture throughout the world, enhance the social image and social influence, social awareness and social value, promote and encourage the development of international communication. Promote cooperation and friendly relations between association and mutual understanding, improving the level of the health of the people in the world through the kung fu competition and fitness. Fu Biao has pointed out that Wushu has originated in China but belongs to the world! It belongs to sports but is superior to sports! Martial Arts is the identity of thought and body language. It is an integration of art and aesthetics, strength and mastery! Wushu is a kind of skill that helps a person develop the coordination and action between the brain and body. By increasing the level of the state`s culture, the high level of national thinking can be achieved. Thanks to Wushu it is possible to lift national spirit. A nation with deep thinking is the nation with dreams, goals and hopes. Only with national spirit can a country become stronger and stronger. With brilliant skill in wushu, outstanding literature talent, noble character and extraordinary courage, Fu Biao became a model to contemporary youth entrepreneurs. He was always generous to tell all his successful experiences for the young people. Fu Biao was often invited to make a speech of success in universities and enterprises. Without preparation of draft, he delivered a continuous speech in two hours and was much loved by the audience.